Misc. Nat. 21 21 1803. 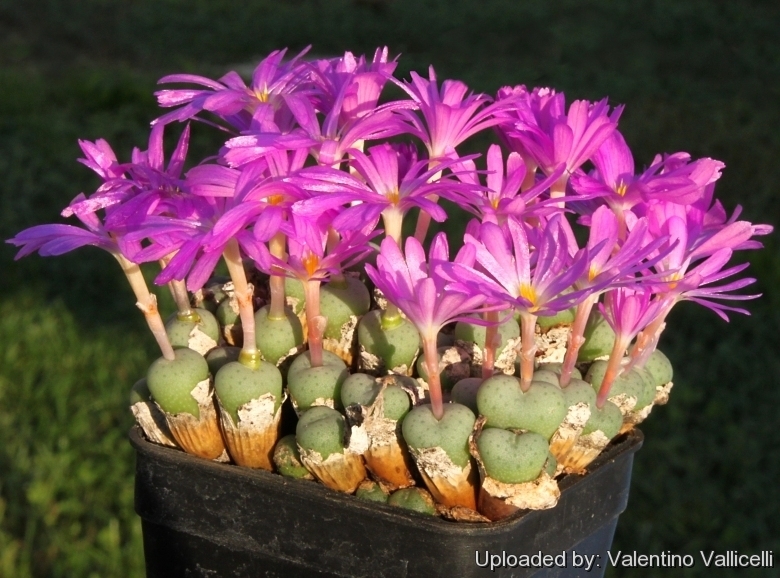 Habitat and ecology: Conophytum minutum occurs in rocky areas on granite, shale, or quartz gravel flats. 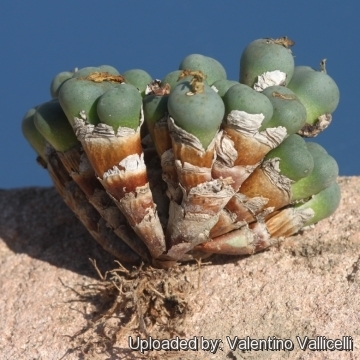 Plants of this genus dry up to almost nothing during the resting period and prove very difficult to find at that time. They must be plumped-up and preferably flowering if they are to be seen in the wild. 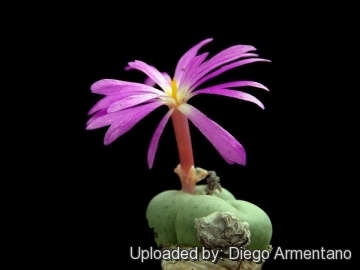 Description: Conophytum minutum is aptly named for it is only 1 cm tall body, it is in fact one of the smallest or dwarf succulent that offsets readily forming small compact or lax mats or ball shaped mounds. It was first introduced into cultivation by Francis Masson in 1795. The numerous tiny bodies are grey-green and smooth. The flowers are pink to purple, or, rarely white. Four subspecies are recognized, the nominate form (C. minutum var. 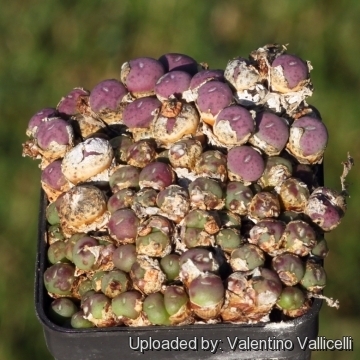 minutum), Conophytum minutum var. 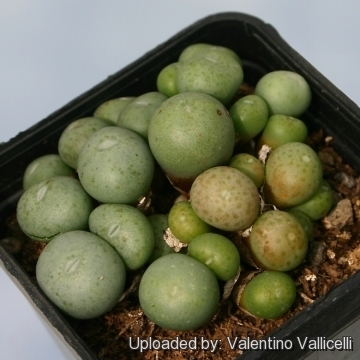 lisabeliae S.A.Hammer, Conophytum minutum var. 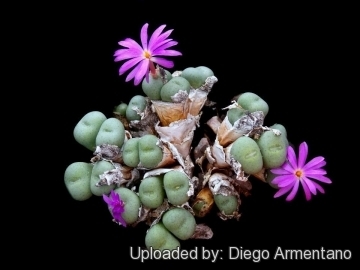 nudum (Tischer) Boom and Conophytum minutum var. pearsonii (N.E.Br.) Boom. Bodies (paired leaves): It have tiny, slightly elongated to obconical, 12-20(-30) mm hight, 5-10 mm wide and thick, heads with large usually convex, truncate, sometimes concave tops round or elliptic in outline. Shiny pale green to dark blue-green to grey-green, sometimes purplish on the sides, unspotted or covered with spots, but dots not prominent, rarely finely papillate, usually polished in appearance. The densely spotted thick sheaths are papery to leathery. 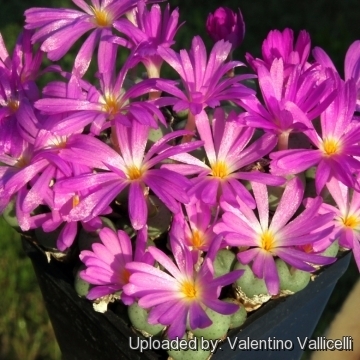 Flowers: Produces masses of bright pink to reddish-purple blooms. They are simple, early diurnal, daisy-like, scentless. Tips of karpels lobes forming a translucent cap at anthesis which is separated cleanly later. Calyx-tube 4-8 mm long. Sepals 4-5 thin adhering to the corolla. Corolla-tube 8-15 mm long, magenta. Petals 15-40 in 2-5 series pink, magenta or rarely white up to 18 mm long and 2 mm wide. Filamentous staminodes white, yellow, or pink crowded. Stamens about 30, Anthers hidden at the base of the tube, rarely exserted. Style thin. Stigmas 4-5. Blooming season: Autumn (summer in a few populations). Fruits: 4-5-locular, shallow, pale tan. 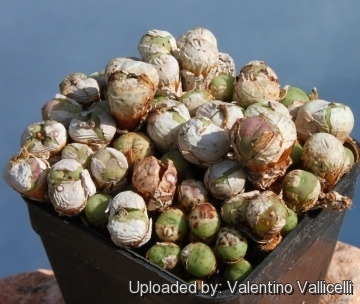 Seeds: Pale brown 0.6-0.8 mm. 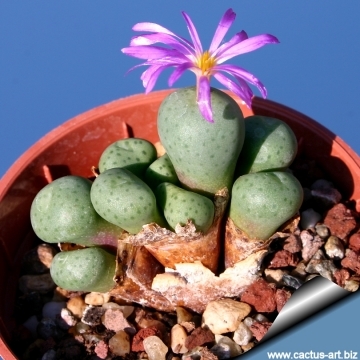 Cultivation and Propagation: is relatively easy to grow. These plants grow on winter rain and head for summer dormancy. They require little water; otherwise its epidermis breaks (resulting in unsightly scars). Water minimally in summer, (only occasional misting when the plant starts shrivelling), but it will generally grow even in summer if given water. Water regularly in winter after the previous year's leaves have dried up. Requires good drainage. Keep cool and shaded in summer, it needs full sun or light shade. Hardy to -2°C. Ensure a very good ventilation. Avoid to repot frequently. This plant may stay in the same pot for many years.